The Egyptian Football Association (EFA) informed Egyptian league clubs Wednesday that the recent decision to allow 300 supporters from each club to attend league matches is currently on hold until obtaining approval by security forces. "For every club, only 75 members, including the board members, will be allowed to attend the league matches until we get the security authorities' approval for the recently suggested number," reads the EFA's letter to the Egyptian Premiere League clubs. On Sunday, the EFA board met with the clubs' representatives before announcing that 300 fans from each opposing club will officially return to the stands for this season's remaining league matches, a move that will end the five-year ban on crowds at domestic football matches. "The limited numbers, approved to attend the matches since the season's start, will continue until the security approval," added Wednesday's letter. 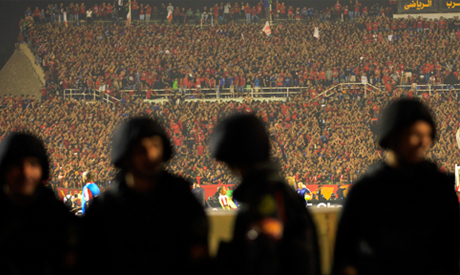 Football fans have been banned from domestic league games in Egypt since February 2012, when 72 Ahly supporters died in clashes between fans at Port Said stadium. The crowd ban in Egypt was briefly lifted in January 2015 but immediately reimposed after 20 Zamalek fans died in a stampede when police used tear gas to disperse crowds lined up to attend a regular league game against Enppi. In the past five years, authorities have permitted a limited number of fans to attend African championship games and national team matches, as per FIFA rules. Champions Ahly currently lead the league table with 60 points after 23 matches, 14 points ahead of second-placed Ismaily.